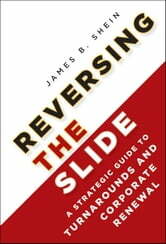 Drawn from the author's decades of experience advising, purchasing, and reviving distressed companies across industries, geographies, and sizes, Reversing the Slide is designed to help executives, managers, and employees revitalize downtrodden companies. It shows how to: select the tactics appropriate for each stage of distress; understand the use of entrepreneurial concepts; avoid pitfalls common to turnarounds; determine the legal, financial, strategic, and operational steps in the process; discover why the principal of "ready, fire, aim" should guide the decision-making process in situations with time pressure and significant uncertainty; and uncover the secrets of effective leadership and governance. James Shein's Reversing the Slide is full of insightful advice on what works, what does not, and why it will prove invaluable to executives, managers, and employees in helping troubled companies before it's too late.